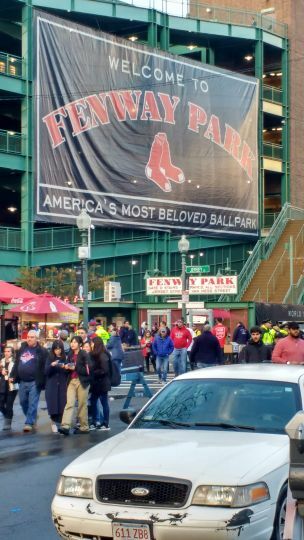 I'm a five-minute walk away from the east-west commuter train that also stops at Fenway Park. 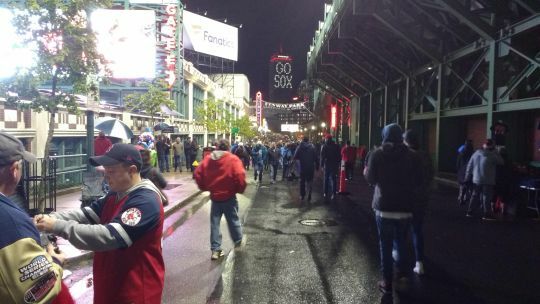 So with Game 1 of the World Series being held at Fenway, Tuesday night, despite not being a diehard Red Sox fan and despite the forecast of iffy weather I felt like I'd be a fool not to take advantage of the logistics. The title for this blog entry is deceptive because I didn't actually "attend" the game. I didn't have tickets, and of course no way was I going to pay scalper prices. 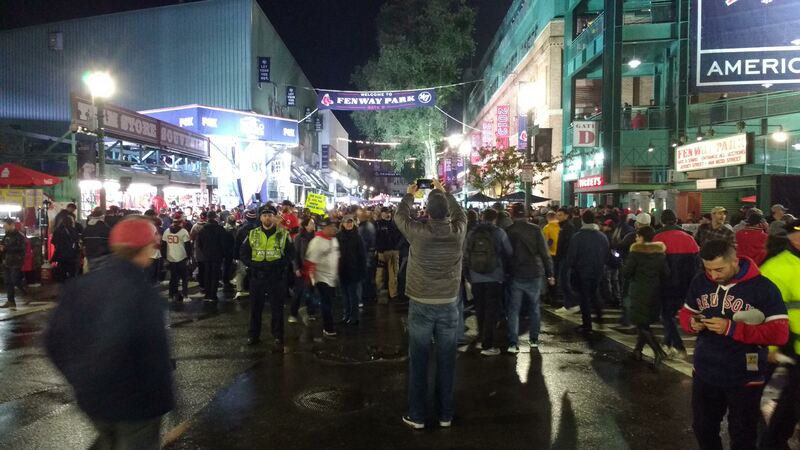 But I thought I'd enjoy the atmosphere outside the ballpark. It's like Wrigley, and maybe a few others, with thriving neighborhoods that are worth enjoying even when the home team isn't playing. I decided to arrive early, in part because I wasn't sure whether the train might already be packed with fans from further out, if I left nearer to game time. My train wasn't too bad, but they only come once an hour, and who knows what the next one was like. So, at 5:15 I arrived at Yawkey station (still so-named even though nearby Yawkey Way has been renamed back to Jersey Street). 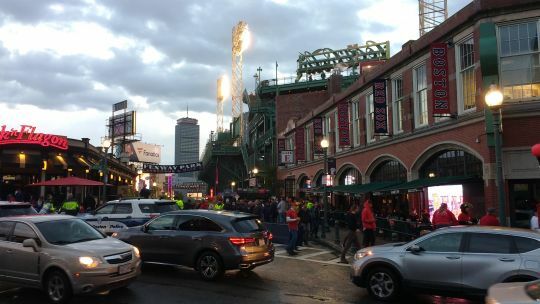 David Ortiz Drive is a short block leading to Brookline Avenue which is one of the bordering streets for the ballpark. It has uniform-number monuments to some of their greats. 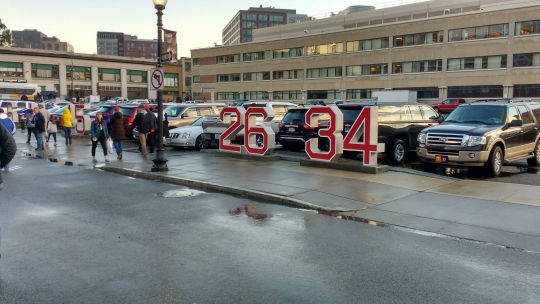 Here you see the ones for Boggs and Ortiz, and to the left you can see the obscured number for Pedro (45). My general plan was to wander around, until game time (8:10 or so), and then take the next train back home assuming things had quieted down outside the park. I was prepared to stay later, if some kind of awesomeness broke out. The area was already busy with people milling around. Cars were double-parked in several places, apparently with official blessing, and the parking lots were advertising a pretty consistent $60 fee. 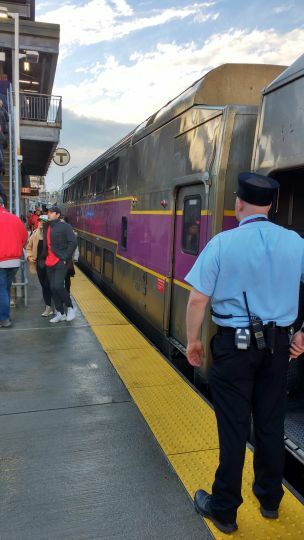 The commuter rail station had a sign stating that the last train of the night would be held until 1:00 am, more than an hour later than its normal schedule; since the game lasted until about midnight, that wasn't really overkill. I took a long way around, heading south on Brookline and then heading back up on Van Ness. 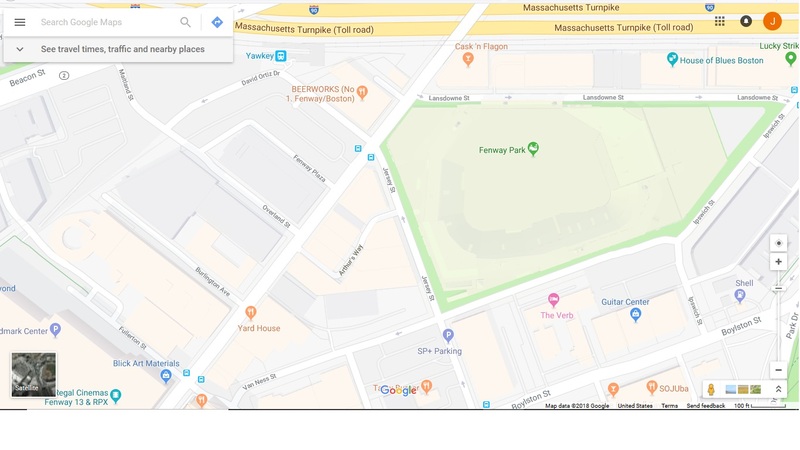 Boston isn't really laid out on a grid and you can get disoriented pretty easily, but I've learned my way around Fenway by now. I reached the intersection with Jersey Street where several street vendors are set up and some of the entry gates to the ballpark are. 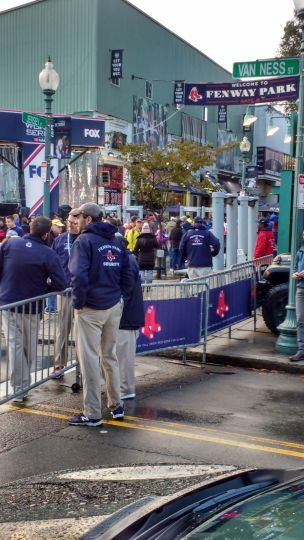 That part of Jersey Street is actually part of the team's venue - the metal detectors and turnstiles are outdoors and the street is just a ballpark concourse on game day - which is why I couldn't use Jersey as part of my circuit. I kept walking, to Ipswich Street and then Landsdowne Street. It all was pretty busy - here is Landsdowne at its junction with Brookline, basically the end of my circuit. All the bars or restaurants I would have considered trying had huge lines of people waiting to get in, to little surprise. Security was everywhere you looked. 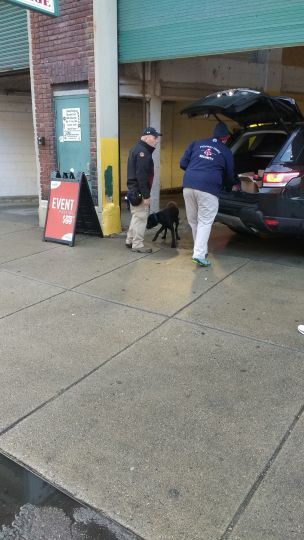 Dogs sniffed the trunks of cars entering the parking lot within Fenway Park itself, SWAT team humvees were stationed in various places, heavy city trucks were eventually parked to block key intersections, and of course you were never out of sight of police officers (uniformed and I'm sure plainclothes). There also was the expected swarm of media vehicles. I mentioned not being willing to pay scalper's prices, but actually I don't think I had an opportunity. There were plenty of scalpers, but they were always asking if I had tickets to sell, not if I wanted to buy. I think I had seen $400 for standing room tickets, on StubHub. Whatever few tickets changed hands on the street at game time were apparently already spoken for. I saw a couple of people who seemed more normal and less scuzzy than the typical scalper, with signs begging for cheap tickets because they were diehard Sox fans or whatever, but I have little doubt that they would have immediately forgotten their loyalty to the team and would have turned a quick profit had someone been suckered in by their pleas. It wasn't raining when I arrived, but around sundown there started to be drizzle, and pretty soon it rained hard and there was significant lightning a mile or two away. 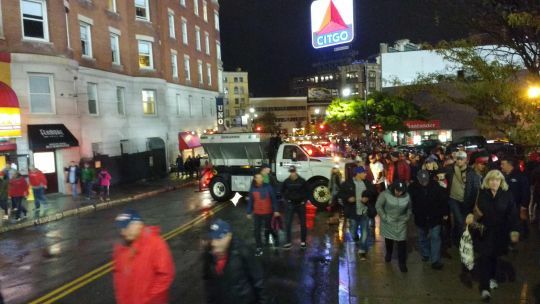 I had brought an umbrella and was walking in light hiking boots, but those who had decided to rely on their hooded jackets decided to cram into the already crowded bars and restaurants, or else (if they had tickets) make their way into the ballpark, because the streets were suddenly pretty sparse of pedestrians. I walked the perimeter of the ballpark again. 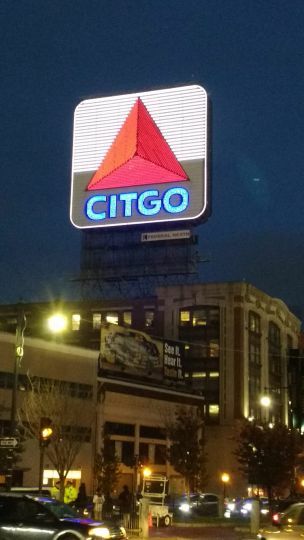 For some reason I never get tired of photographing the Citgo sign. 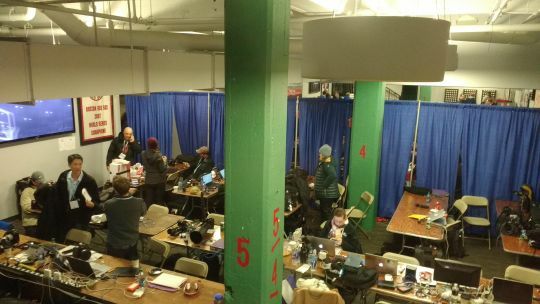 Somewhere along the perimeter, I spotted a window into which you could see a makeshift Media Room. Even aside from the rain, I have to say that the atmosphere somewhat disappointed me. I guess I was expecting something like a big block party. 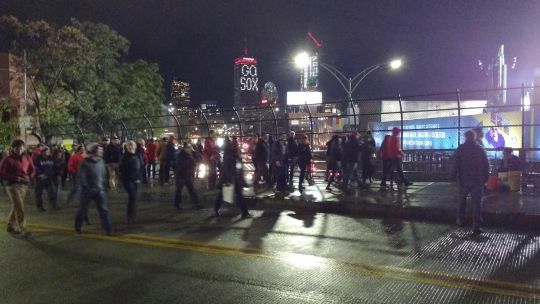 There was one guy playing makeshift drums on the bridge over I-90, and a couple of times I heard a "Let's Go Red Sox" chant or similar commotion from people lined up to get inside the park, but that's just like a normal game day. 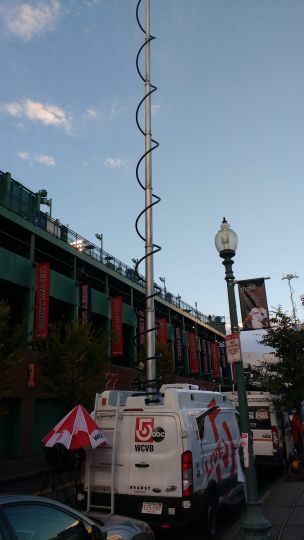 A couple of locations on my circuit had a very strong odor of weed, I think maybe from the broadcast media enclave behind a chain link fence within the Fenway Park premises. I believe the Mayor and the Police Commisioner had let it be known that no nonsense was going to be brooked, and maybe that accounts for what I saw on the streets. Certainly, I wasn't hoping for hooliganism, especially with the presence of a smattering of Dodger Blue jerseys and hats, and I'm not sure exactly what I was hoping for, but this was altogether too normal. So buttoned-down. I opted to cut my evening slightly short and take a train that departed shortly before first pitch. Still, I'm glad I went. 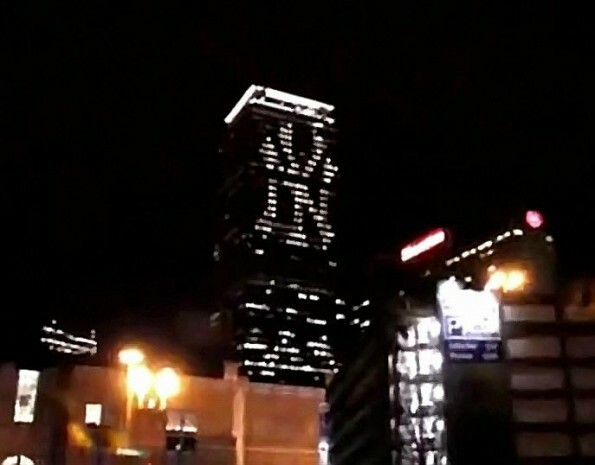 After sundown, the Prudential Building had their lights on to urge on the Sox to victory, and I think any baseball fan would have felt some excitement, Sox fan or not. Game 1 of the World Series, baby! 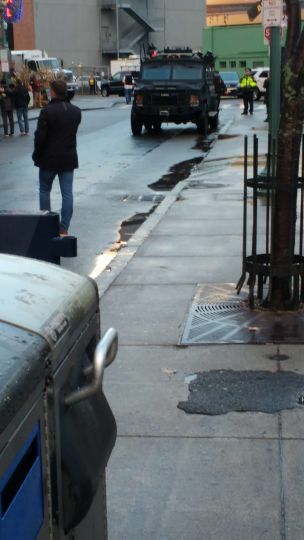 BTW, you may be interested in this LOL-worthy prank that was played upon Boston a few years ago. "...Boston isn't really laid out on a grid and you can get disoriented pretty easily,..."
Understatement of the year. When I first took my son a few years ago, I think I crossed the Mass Turnpike about eight times trying to get there. I felt like Chevy Chase in London. But thanks for this. This kind of experience is a ton of fun. I was in Kansas City while the Royals were in San Francisco for the weekend series in 2014. We went to the Power and Light District during the game, and it was the most fun non-Twins baseball experience I've ever had. I happen to have a work trip to Hartford, Conn., this weekend, so I'm suspecting something of the same if we sneak up to Boston for an evening. I happen to have a work trip to Hartford, Conn., this weekend, so I'm suspecting something of the same if we sneak up to Boston for an evening. Be aware that the Series moves to LA next. But I'm sure the taverns in Boston will be jumping - moreso than in Hartford. "A couple of locations on my circuit had a very strong odor of weed..."
Weird. Every single blog of yours contains this exact wording. Your suggestion that the odor of weed emanated from the media pool should weigh heavily on the proprietors of this site!